This security poster illustrates the Former Yugoslavia new anti-personnel stake mines, the PMR-3, the PMR-4, the PPMP-2, and the PMR-U. These four types of stake mines were designed and deployed furing the war in Bosnia. All use central fuze wells, and all mines are trip wire operated. This security poster features sectioned illustrations of the PMR-3, the PMR-4, the PPMP-2, and the PMR-U as well as a sectioned UPMR-3 fuze and the technical specifications of all four anti-personnel mines. Sectioned illustrations of the PMR-3, the PMR-4, the PPMP-2, and the PMR-U as well as a sectioned UPMR-3 fuze. The technical specifications of all four anti-personnel mines, the PMR-3, the PMR-4, the PPMP-2, and the PMR-U. 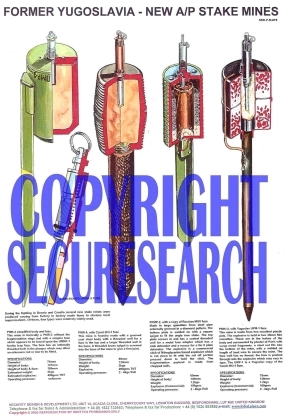 This security poster features sectioned illustrations of the PMR-3, the PMR-4, the PPMP-2, and the PMR-U as well as a sectioned UPMR-3 fuze and the technical specifications of all four anti-personnel mines.